From the moment the Horizon games were announced, it was clear they were happening in a very different world to the other Forza games. Far from the po-faced drabness of the Motorsport series, where realistic simulation is the goal above all else, the spin-off titles immediately emphasise fun and excitement; enjoying yourself was suddenly more important than being a skilled driver. All manner of high-performance vehicles race along scenic roads towards a bombastic festival site full of fireworks and cheering crowds, while music popular with Young People is pumped through the speakers. Impossibly attractive and gregarious folks congratulate you personally on being just an incredible driver, worker, human being. Fabulous prizes pile up from every direction. 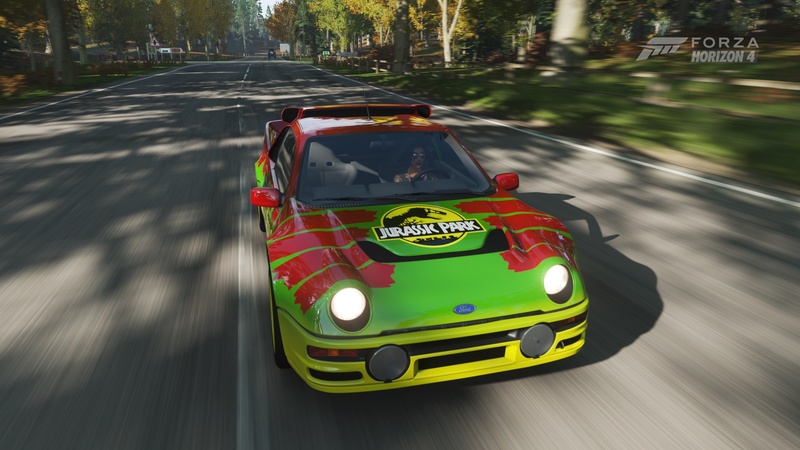 In short, the universe in which Forza Horizon exists is an impossibly perfect and magical place. A utopia. There aren’t a lot of video game utopias, which is both a surprise and no surprise at all. It’s surprising because games are a billion dollar industry that crosses most economic, social and political lines; thousands of games are being developed at any given moment, by big studios, organisations and two guys named Peter who met in high school. By all rights there should be a glut of titles in such a well-known genre. Except that in reality games—at least those with some form of narrative structure—are frequently bombastic, conflict-heavy affairs that prioritise player struggle and involvement in all scales of traumatic events. Something is broken and you need to fix it. Worlds where everything is fabulous and everyone holds hands don’t fit into a system where gunfire and fisticuffs are so popular. UTOPIA noun: (the idea of) a perfect society in which everyone works well with each other and is happy. Of course, utopian fiction is a slightly different beast to the concept of a pure utopia. While there are some universes that attempt to display an actual utopia in action—Star Trek‘s friendly society of infinite food, considered diplomacy and good will toward all species springs to mind—most of the literary genre is concerned with the unworkable nature of a perfect world. In a sense, most utopian worlds in fiction are simply dystopias viewed from a different angle, or early in the transformative process. The truth of the matter is right there in the origin of the word: utopia is Greek for “no place”; the very concept of a utopia is fantasy, even inside a fictional world. In a delightful mashing together of etymological overlap and a grotesquely appropriate pun, there’s another word for a perfect society: eutopia. While utopia was coined as a sardonic take on the idea of perfection, eutopia (the Greek for “good place”) has come to mean a practical, attainable perfection that could conceivably exist in the real world. Hope in place of cynicism. Forza Horizon is littered with eutopian touches. Most prominent, and actually woven into the mechanical flow of the game, is how impossibly nice, kind and friendly everyone is when you interact with the festival. Characters in charge of the event warmly welcome you in, noting how accomplished you must have been to get to this point; finishing a race frequently awards you with an encouraging comment from the omnipotent whoever on your radio; folks much, much cooler than you frequently ask for your help or inform you about events that may be of interest. You’re invited to everything with a bare minimum of effort on your part, no matter how skill-based or exclusive something might seem on the surface. Among the normal championships, cross-country events and circuit racing, there are clandestine street races, which are not only open to you, but also run by perfectly sweet and understanding people who would never dream of kidnapping your girlfriend. The street races themselves are treated as Extremely Illegal and Unsanctioned but given all the sinister cachet of a kid sneaking an extra cookie; other characters practically snickering behind their hands and gasping with faux drama when the idea of naughty night races is discussed. It’s made very clear to the player that everyone at the Horizon Festival is there to have a good time, and that the community of fictional racers and organisers is dedicated to achieving that across the board, not just for the player. And you know what? It’s pleasant. There’s something beautiful and relaxing about booting up a session of a game that won’t make demands, won’t yell at you, won’t force you to endure endless challenges to unlock that character you’re excited about. It’s nice to be in a nice world where even the person telling you what to do seems like they’d rather give you a hug. Eutopian ideals ripple out from this simple concept of a Nice World. When you show up for the festival, you are immediately given the chance to drive around in something ridiculous—in Horizon 3, for example, it’s a black and yellow Lamborghini Centenario—before the game allows you to pick one of three starter cars. This choice is, in retrospect, absolute nonsense, as Horizon games simply can’t stop giving you free cars every ten minutes. When you combine prize winnings, vehicles given to you as part of the narrative progression, barn finds (iconic cars you simply stumble across at random points in the world, which are then gifted to you for free after someone else repairs them) and level bonuses, it’s easy to forget you can actually buy cars with the money you earn racing. It is an underrated aspect of the series that you are briefly allowed to forget about the terrifying spectre of capitalism. Yes, things cost money in the world of Forza Horizon, but you make more than enough to cover those costs by simply doing the fun and exciting activities you were already engaged with. 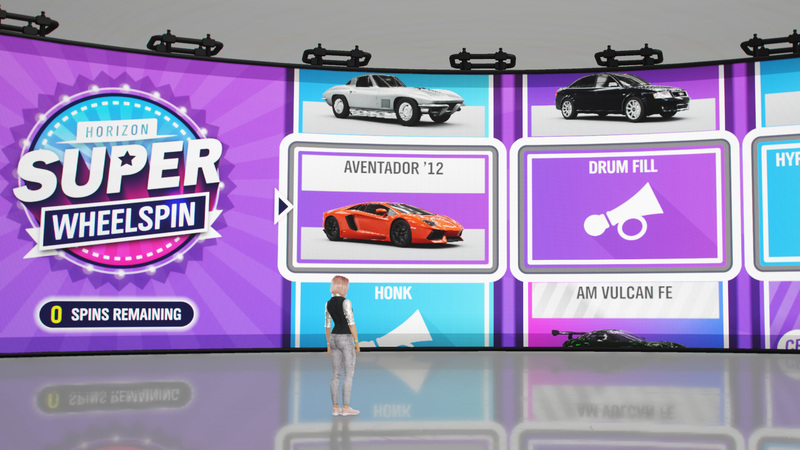 Even if you didn’t, the game showers you with prize wheels that reward players with new cars, money, clothes; these wheel spins come up so often that you barely even have to care that you spun up something worthless, because you know another chance is arriving shortly. There are also challenges that go off with such frequency you’re unlikely to have realised you were being tested on anything, and constant opportunities to drive different cars in specialty races. Horizon, in it’s own glitzy, excitable and pop culture-fuelled way, sets up a universe where everyone is given exactly what they need to survive and the freedom to use their energy on what they want instead of what they need. That’s right, Forza Horizon is socialism. Again, this is comfortable, friendly, nice. Without the usual video game (and real life) pressure of achieving certain results to access the next level, or piece of equipment, or opportunity, Horizon lets players focus on whatever leisurely activity they desire, all while accumulating more rewards to ensure their continued comfort. In Horizon 3, the central conceit shifted from festival goer to festival CEO, putting players in charge of the entire enterprise and letting them decide what races would happen when. 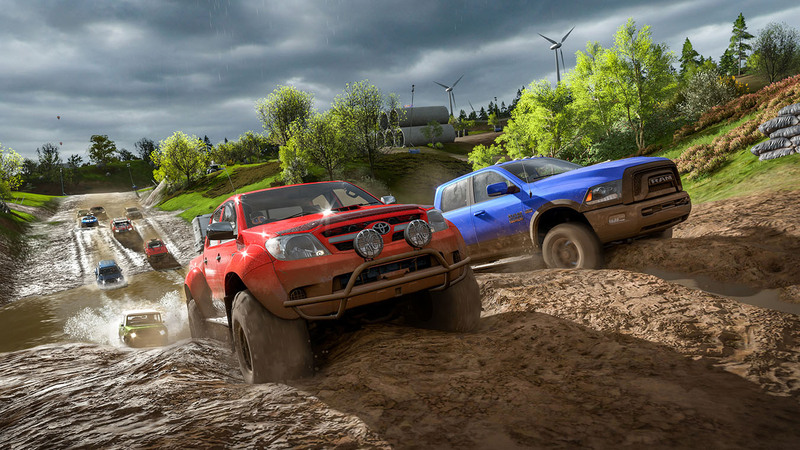 In a sense, this was an extension of the freedom of the series, but in practice it was an added stress in an environment that had nearly zero stress; it’s perhaps no surprise to see the feature gone in Forza Horizon 4, where you are once again relegated to The Greatest Driver Anyone Has Ever Seen and stripped of any responsibility beyond having an absolutely wicked time. It’s maybe a little too close to the bone of the concept of utopia in general that in order to truly represent one, even a game about racing cool cars had to put logistics back into an all-knowing authority’s hand to let its citizens truly enjoy themselves. That distance from the tribulations associated with organisation and progress, removing the need to obtain and juggle resources, is key to why Horizon seems like an oasis of calm, progressive thinking. Don’t have a car? Here are dozens of them. Don’t like the colours? Hundreds of design options have already been made by dozens of kindly players. Nowhere to stay during the festival? Here’s a free house. That last one is the most fantastical and sadly unbelievable aspect of this eutopian paradise: the idea that a group of well-meaning and capital-heavy businesspeople would give away a fabulous cottage and surrounds to a race car driver just because they helped out with some contract work. Therein lies the magic of Horizon. And, by extension, the potential magic of video games. No corporate sponsors muddy the internal world of the festival or sully the airwaves of the many and varied radio stations. No shady billionaires pull the strings. Everyone always has the best of intentions, diagetically, because they know it leads to the best outcome for everyone involved. And they’re nice. It’s all so darn nice. It’s warm and happy in a way that can be complicated for non-interactive mediums. If you make a movie about a perfect place—not a “perfect” place that turns out to have a bumbling wizard behind a red curtain—then nothing in particular is going to happen. But there’s no need for the same flavour of forward momentum in a game; if my only motivation for playing more of an experience is the chance to extend that experience, it works. It’s hard to see in an industry with so much focus on any and all types of conflict, but it’s also one of the few places where you can design an experience that completely rules out unfriendly conflict. I mentioned earlier that utopias in fiction are often just dystopias that have yet to decay. Forza Horizon neatly demonstrates the viability of a eutopian video game because it refuses to sacrifice the ideals of its setup to the maw of progress. Moving forward as a festival racer isn’t dependent on loss, conflict or gaining any sort of treasure, it’s something that just happens if you seek it out. If you interact, you win. Video games, in theory, allow one to create a eutopia, a place of practical, achievable perfection, because the utopia is crafted with individual manipulation in mind. We always craft the experience, to a degree. And if the game design allows the creation of something earnest, kind and focused on the enjoyment of all, then players will be active in the pursuit of that goal. Not bad for a racing game about dance music and coloured wristbands.